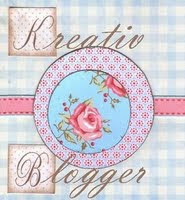 Thanks Deana http://deanajasondayne.blogspot.com for the Kreative Blogger award!! I feel so honored! :) I know that you did this just to get your pictures off of the front on my blog! :) Anyways, thanks for everything but especially for being the very best freind that anyone could ask for!!! You and your family are the best and mean so much to me and my family!!! 3. Link the person who nominated you for this award. 4. Name 7 things about yourself that people may not know. 7 things about me that most people may not know???? 1. I LOVE being a stay at home Mom! I love being able to take and pick my children up from preschool and hear all about their day!! I love reading stories with them and snuggling with them at nap time!! I LOVE big hugs and kisses from both of my sweet little boys!! I am so blessed!! 2. We are in the process of building a house and are currently living with my dad for the next 4-5 months!! So far it had not been bad for us, but my dad may tell you something different. :) He has graciously open up his house to us and for that we are so thankful!! 3. I am currently working part time (12 hours per week) as a reading interventionist! It feels good to help those children who are sturggling learn to become efficient readers!! 4. 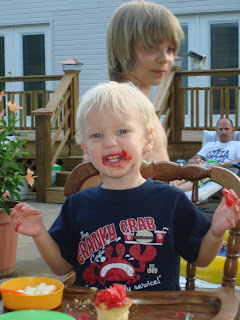 I am totally stressed out about where I am doing to send Cooper to school!!! I go back and forth daily between Boyd Buchanan (private) and CSLA (public-magnet) which are both excellent schools!! 5. I LOVE the Tennessee Vols despite our new crazy, outspoken coach!!! We have season tickets and try and go as often as we can!! 6. I just started couponing and I hope to save LOTS of money at the store from now on!!! 7. I love reality tv and well as mindless dramas!!! I am go glad that the fall shows are back on!!! Dancing with the Stars, Biggest Loser, Grey's, Desperate Housewives, just to name a few!! Misyt and I went to college together and I have enjoyed keeping up with Misty and her adorable family through the blogging world!! LeeAnne and I are friends through our playgroup and we have gotten to become closer over the past couple of years. Our children play so well together and we truly value their friendship!!! Alicia and I are also friends through playgroup and even though I do not see her much anymore, it is great keeping up with her family through her blog. She is also expecting baby #3!! Becky and I also know each other through playgroup and I love hanging out with Becky and her sweet children!! Max and Cooper play so well together and I love spending time with them!!! I can't wait for Wesley and Hudson to really start playing with each other!!! I know that I can call Becky at any time for anything!!! Thanks for being such a great friend Becky!! Elizabeth and I know each other from college and I LOVE reading all of her posts. She always makes me laugh! I can't wait to hear all about baby #3 very soon!!! Amanda and I go way back!! We went to high school together and then to college together!! She was my "big sister" in college and I am so thankful for her and her sweet freindship!!! Even though she lives in California now I still "try" to keep in touch some and I hope eventually they move back closer to Chattanooga one day! I would love to have our kids grow up together!!! Jennifer and I also know each other through playgroup, but unfortunately they have moved to Mississippi and we never get to see them anymore. Thankfully we have our blogs and facebook to keep in touch with each other and our busy little families!! We miss you guys and call me if you ever come in to visit!!! Ok so there you have it!! Have fun!! Chris got one of his birthday presents today (even though it is a few days early). We went white water rafting with our best friends Deana and Jason. We all had a blast even though Jason and I were thrown out of the boat and cruised down the river for a little bit. At first we were both so scared because we could not catch our breath. The water kept pouring over our heads, but eventually we got to calmer water and everything was fine!! We all had so much fun and cannot wait to go back soon!! We LOVE you Chris!! Happy Father's Day!!! I also want to give a big props to my dad as well! I love you Dad and sorry that I do not have any recent pictures of you! You are amazing too!!!! I love you! 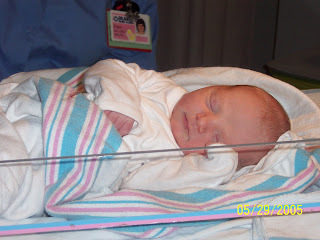 Four years ago May 29, 2005 our sweet baby boy was born. I will never forget the moment right after he was born!! I was so overwhelmed with joy, love, excitement and peace!! I was in complete awe of our wonderful little miracle. 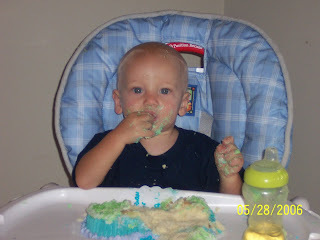 It is hard to believe that four years have already gone by!!! I am sad to think that he is not my "little" baby anymore but very happy to watch him grow into a fun, energetic, silly little boy!! I love you with all of my heart sweet boy!! 3rd Birthday at Pump It Up!! This weekend was a busy one for us! We had Cooper's last t-ball game on Saturday afternoon and the that night we headed downtown for the boys to play in the water. They had a blast but were exhausted by the end of the day! Yesterday we meet up with Amy and Brain as well as Chris parents and grandmother and had some yummy lunch at Tony's. This is one of my favorite restaurants and it was so good!!! That night we went to dinner and a movie with some of our friends and saw State of Play and it was really good! I knew nothing about this movie, but I really liked it! Anyways today was a BIG day in our house.....I TURNED 30!!!! Thirty does not bother me (yet) but then again I have only been thirty for about 6 hours now!! :) Anyways my sweet husband planned a surprise party for me and lots of our family and friends came over to help me celebrate! We all had a great time and I am so thankful for wonderful family and friends!! Here are some pictures from our day! I hope that everyone had a great long weekend! My wonderful husband (aka the party planner)! My sweet little boy who is can be such a little stinker! Me and the best freind ever- Deana!!! Thanks to everyone who helped make this day a very special birthday!!! I am so thankful for all of you!! On Tuesday Cooper's preschool had "Muffins with Mom." It was so nice and the kids were all so excited! Each child made a really cute tote bag for their moms. They were so proud of their gift because it was a surprise!! Also the teachers surprised us with a WONDERFUL scrapbook from the year! It was truly amazing! The book has to be at least 30 pages! Cooper and I have both enjoyed looking at all of the things he has done over the past year! Anyways, here are two pictures from our special morning!! Me and my sweet boy! Cooper proud of his gift for me!! Today was another special day at preschool. They had their end of the year performance and it was SO cute!!! Here are some pictures from our little star!!! Mrs. Judy, Cooper and his best friend Caleb!! Each child had a "special part" and Cooper and a few other little boys were fisherman in boats. They had two songs they had to sing and they did a wonderful job!! Cooper and Alex "catching their fish!" It is hard to believe that preschool is almost over. Cooper only has one more week and then it is time to celebrate the summer! Wow, this year has gone by SO fast!! !